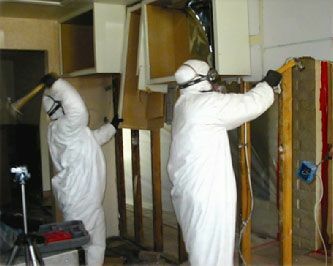 Mold remediation, or just remediation, is the process of removing and cleaning an environment of mold growth and mold infestation. We write the mold remediation strategy and mold cleanup strategy in NJ, PA, NYC, LI, FL, and CT through our after each of our mold investigations. It is NEVER recommended for individuals who are not Certified Mold Remediators (CMR) to attempt to perform mold clean up or mold remediation on mold contamination greater than 10 square feet, regardless of the type. All individuals performing cleaning need to take the necessary safety precautions. These include but are not limited to latex gloves, protective eye wear, and wear at a minimum a N95 mask. It is important to make sure to thoroughly dry the basement or impacted area during the mold remediation process. Due to the fact many mold types are both pathogenic and toxic, it is important to follow guidelines of an accepted authority. The New York City Department of Health & Mental Hygiene Bureau of Environmental & Occupational Disease Epidemiology has developed the Assessment and Remediation of Fungi in Indoor Environments document for help. During mold cleanup it is important to be very thorough. 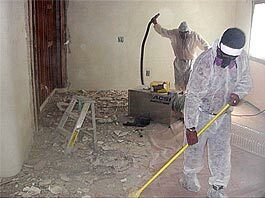 The Environmental Protection Agency (EPA) is another great source for information on mold remediation and mold cleanup. Prior to beginning any mold remediation it is important to find the source of the water intrusion that is causing the mold problem. If the water problem is not resolved mold can grow back within 24 – 48 hours. We provide the best in New Jersey, Pennsylvania, New York City, Florida, and Connecticut mold removers. Schedule Your Appointment for your Business or Household’s Remediation Protocol Reporting in NJ, PA, NYC, FL, & CT Today!